The Atmosphere Component of CarboEurope- IP will establish and operate the Atmospheric Observing Systemneeded to quantify in a top-down approach the average European carbon balance and its regional distribution at a typical spatial scale of 100 km with temporal resolution of one week. 2.1 To provide the high precision, high-frequency, long-term atmospheric concentration measurements needed to invert for magnitude and variability of sources and sinks in Europe with a typical resolution of 100 km every week over best sampled areas (MO1, 4, 7). 2.2 To develop innovative methodologies using Carbon Cycle related tracers and isotopes to attribute the CO2 concentration in the European air shed to each of the constituent parts of the fluxes: fossil, oceanic, and terrestrial (MO8). 2.3 To provide the data for a continental scale carbon data assimilation system (CDAS) (MO3). The atmospheric CO2 and auxiliary tracers distribution delivered by the Atmospheric Observing System of CarboEurope- IP will serve to quantify the European carbon fluxes using different atmospheric transport models in an inverse mode. Our strategy is to enhance the Atmospheric Observing System over Europe by adding key stations over undersampled areas, by combining different atmospheric networks into complementary activities and add continuous measurements on tall towers as an additional scaling instrument, and strongly relying on the infrastructure that is already in place funded through national and former EU efforts. Given the small differences in atmospheric concentrations over Europe , high-precision, highly accurate measurements are of utmost importance. In a quality control activity, we will therefore quantify and monitor in a dynamic fashion calibration scale differences of GHGs and related tracer measurements between the European laboratories and field stations contributing to the Atmospheric Observing System in order to achieve the precision and accuracy goals given in Table 1. We will attribute the European CO2 gradients within the atmosphere to different components of the fluxes: oceanic, terrestrial and fossil, based on the analysis of multiple species in flask air samples and at some in situ sites. Assessing the fossil fuel CO2 component we will use a unique technique where European laboratories have a strong leadership, that is high precision measurements of 14CO2, 222Rn and CO. This approach will provide fossil fuel CO2 mixing ratio determinations on the order of 20% accuracy in moderately polluted areas and respective emissions estimates with an uncertainty of 25-35%. 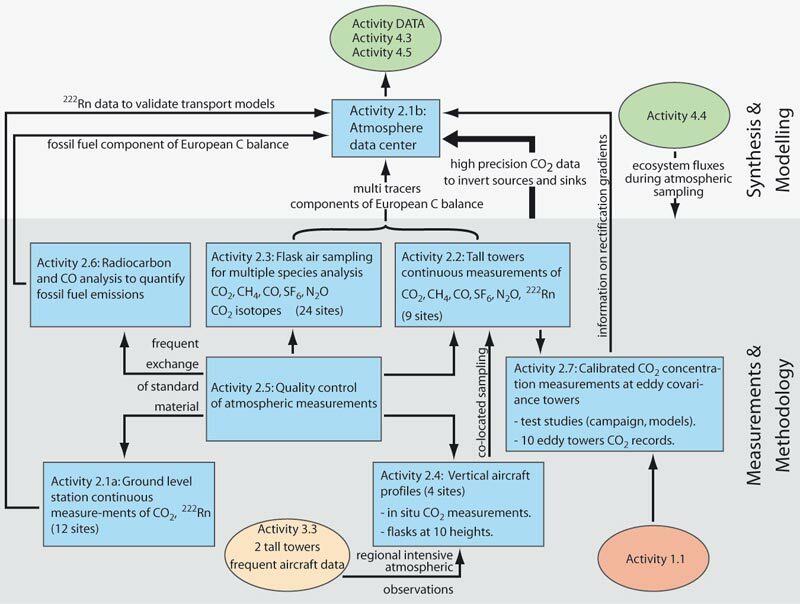 The planned Atmospheric Observing System thus consists of seven complementary activities that use a balanced choice of sampling and measurement strategies to obtain as complete a representation of the CO2 field across Europe in the planetary boundary layer, and in the free troposphere as possible. One important consideration underlying the sampling design is to take advantage of the mixing processes in the planetary boundary layer which smooth the high variability of land-biosphere atmosphere exchange CO2 signals close to the ground. We expect that the synergetic use of atmospheric measurements and inverse models in CarboEurope- IP will enable us to downscale carbon fluxes using atmospheric measurements to the sub-continental level within Europe (e.g. Eastern European countries, Mediterranean area) and to the level of smaller regions of typical size 1000 km over the best sampled areas within north-western Europe (e.g. France, Germany, Benelux countries). Uncertainties on flux estimates will be assessed by using a suite of different atmospheric transport models, and based on different data selection procedures established for each site. We expect an uncertainty for the overall European carbon balance of 20%, that is about ± 200 Tg C yr -1. We expect an uncertainty for regional fluxes in the best sampled Western European regions of 30% each month. This uncertainty can only be further reduced by applying the integrated approach of Component 4 (Continental Integration). * These values are the WMO/GAW goals for global network accuracy among different laboratories in the northern hemisphere. (In the case of the other species, no official WMO/GAW goals exist at this time). ** For Radon, this value is the detection limit goal. The organisation and the flow of data and information within the Atmosphere Component and with the other Components of CarboEurope-IP are shown in the figure below. Component 2 links mainly to Component 4 (Continental Integration). Component 3 delivers high precision measurements of CO2 and 14C data from two tall towers in Southwest France during the year of the Regional Experiment. European contribution to the global, internationally co-ordinated effort to enhance the set of in-situ atmospheric observations for diagnosis of the current distribution of carbon sources and sinks. Delivery of a coherent ensemble of atmospheric CO2 and Carbon Cycle related tracers to atmospheric transport models. Attribution of the European CO2 gradients within the atmosphere to different components of the fluxes: oceanic, terrestrial and fossil.